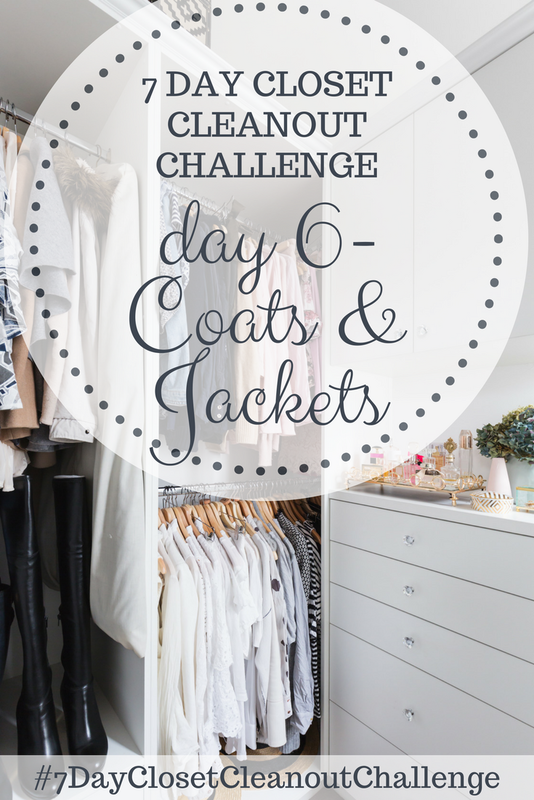 It's Day 6 of the 7 Day Closet Cleanout Challenge! We're on the home stretch toward having a well organized closet full of the items that make us look and feel our best. If you missed the post that explains what the challenge is and how to get entered into the giveaway that's taking place at the end of the week, go back and read it HERE. Today we'll be cleaning out our coats and jackets. I find this to be one of the easiest days, so hopefully you will too! Would I buy this if I saw it in the store today? Is it still in good shape? If you answered "yes" to all three questions, put it in the KEEP pile. If not, it's time to get rid of it. For the ones you're getting rid of, if they're in really good shape (especially like-new items), put them in the SELL pile. If not, they go in the DONATE pile. For the SELL pile, you can either sell these in a garage sale, on Craigslist, to a local consignment store, or to my personal favorite, ThredUp. I use ThredUp because it's so easy. You just request a free clean out bag from their website, fill it with your name brand clothing that's in good condition, and mail it back (free of charge). They will pay you for the clothes they keep and decide to resell. For your DONATE pile, bag it up and take it to the charity or shelter of your choice. If donating to a charity, make sure to ask for a receipt so you can deduct it on your taxes. You can find some guidelines for how to value your used clothing here. No surprises here - I hang my jackets and coats in our hall closet by the garage door. I find it much more convenient than keeping them in my bedroom closet, especially bulky winter coats. The most aesthetically pleasing way to hang coats (or anything, for that matter) is to hang them from shortest to longest. I put the shortest coats on the left-hand side (generally my kids' coats) and work my way to the longest coats on the right-hand side. This also frees up space under the shorter coats, where I added a small shoe rack for the entire family to store their most-often worn shoes. I'd love to hear how all of you store your coats and jackets - and to see pictures! Don't forgot to post those pictures on Instagram or Facebook with the hashtag #7DayClosetCleanoutChallenge to be entered into a drawing to win a $25 Target gift card! 7 Day Closet Cleanout Challenge!